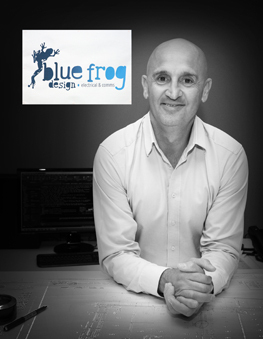 Blue Frog Design evolved after Owner and Managing Director, John Federico, recognised a gap and the huge potential in the Electrical & Telecommunications industry. Blue Frog Design is charged to revolutionise all things Electrical & Telecommunication. Established in June 2015, Blue Frog Design was formed by its Owner / Managing Director, John Federico. Although a relatively young Electrical & Communications consultancy firm, its team has years of subject matter experience. Whilst achieving several key milestones in the short journey travelled, Blue Frog Design continues to build a strong reputation in Urban Residential Development, Sporting Complexes, AS3000, Communications and NBN and Power Utility HV/LV OH/UG Projects and Programs. Although Blue Frog Design prides itself on its subject matter expertise, its single driver for continued success, trust and enjoyment is good old customer service. Blue Frog Design has prospered to become a sustainable and yet solid accredited Electrical & Communications consultancy firm proudly renowned for its knowledge and high level Duty of Care. With a strong focus on Account Management, Customer Service, Client Satisfaction, Quality & Updates Blue Frog Design is your "go to company" for everything Electrical & Tele-communication.